One feature that’s noticeably absent on the upcoming Open Source Scan Converter is full HDMI output. Instead of HDMI, the unit has DVI. This is to avoid the frankly extortionate licensing fees the HDMI consortium charge for any product that wants to have a HDMI port on it. This isn’t a problem for most folks, since most setups can easily accommodate DVI and separate audio in one way or another. 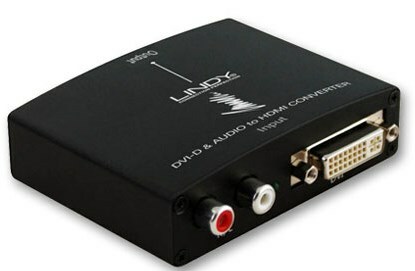 If your system is entirely configured around HDMI video and audio however, a little converter such as this one from Lindy might just be what you need. The unit ships in a small white box, mercifully without any blister packaging or other frustration inducing packaging materials. The outside of the box has the usual Lindy logo and a sticker denoting which particular converter it is. Inside the box is the converter itself, a one page instruction book and a multi-region power connector. To use the PSU you simply find the correct prongs for your particular country and snap them into the adapter (indeed, it’s a transforming transformer). The converter itself is housed in a sturdy metal case with a slight curve to the top part, which is decorated with the Lindy logo. Overall, first impressions are good and the unit looks and feels like a quality bit of kit, though looks can be deceiving. With the power supply assembled, it’s just a matter of connecting everything up. DVI and analogue audio cables go in one side, HDMI and power cables go in the other. There are no adjustments you can make on the unit, it’s designed to be entirely plug and play. After connecting the unit up and powering our system on we tried some Tempest 2000 on the Atari Jaguar. Surprisingly, the converter seemed to be adding a lot of noise, or hiss, to the audio stream. After powering on the console it became apparent why. For some reason this converter amplifies the incoming audio to absurdly high levels. If you connect an audio source directly to the unit, the volume will be so high that parts of the audio will become mangled, even if you compensate by turning your home theatre receiver down. We’re not talking about some kind of flowery, subjective audiophile “mangling” of the sound either, we mean it’s actually, non-subjectively distorted into noise. Switching to the Wii, for instance, you could press the “Home” button, and the chime that the Wii makes when you open the home menu was reduced to static noise at its louder/higher pitched parts. Since we were using an Extron Crosspoint RGB switch with the console, it was possible to use the volume adjust on the switch to reduce the volume of the audio as it left the switch. This kind of feature is rare on RGB switches, you certainly don’t usually find it on consumer grade gear. With the volume reduced, the audio became better from the Lindy unit, but there was still a high amount of background hiss, the same hissing sound that you get if you ever get an older or cheaper analogue system and crank the volume right up to the maximum while nothing is actually playing. Needless to say we were left entirely unimpressed with the performance of the unit. Lindy’s corporate motto that they proudly emblazon on their packaging and website is “connection perfection”, but yet again we’re left disappointed and cannot recommend this converter. It has one job and pretty much fails at it.